SPRING SESSION of PAI classes begins! Spring classes at Stagebridge’s Performing Arts Institute begin, opening on April 8 and running through the week of June 14. Our continuing Wednesday Elder Salons have taken root for the long term. We are exploring the awesome and difficult dynamics of living into our elder years, challenging ageism and seeking depth of meaning and purpose. We are riding the wave edge of a massive global emergence... olders becoming Elders through dialogue, exploration, sharing, and deeply caring relationships. Co-sponsored by Stagebridge and the Elders Action Network, these FREE gatherings are facilitated by a team of Elders who have stepped up from our Salon community. Since our beginning in January 2018, we have shared in depth about Elderhood, Community, Spiritual/Existential Meaning, Relationships and Intimacy and so much more. We choose topics together each quarter and set aside the last half hour at each Salon for warm and engaging conviviality. The next meeting will take place in the CYF / Basement on Wednesday, May 1st. Come join us! Stagebridge and The Caravan of Stories at Berkeley's Silk Road House partner for the second year to present a special storytelling event! Enjoy an afternoon of entertainment while helping to support Stagebridge with Stories from the Steppes, featuring tales from Stagebridge storytellers Suz Shampanier, Eleanor Clement Glass, Melissa Hobbs, Ida Johnson, Kiran Rana, and guest storyteller Jim Fresquez. Join us for a storied journey to the heart of the Silk Road, as the folktales of Central Asia open a window into a world where a slave can find the lake where the sun and the moon bathe, a wise and brave queen can ride into battle to save her husband, and more! Lunchtime Storytelling season concludes on May 16! The final LUNCHTIME STORYTELLING of the season at Stagebridge happens on May 16! This event wraps up the season with Stagebridge storytellers Lois Kincy and Tom Pulsifer for the final lunchtime tales, located in the Choir Room at the First Congregational Church Oakland. Each free, hour-long noontime event features two student storytellers with a variety of pieces-some funny, some poignant, and all of them heartfelt. Tune in on Tuesday, May 21 at 3:00pm to the next installment of Stagebridge’s FREE one-hour STORYTELLING CONCERT that you can listen to from the comfort of your own home. At the conclusion of the stories, listeners can participate in talkback discussion. Through our partnership with Covia Well connected (formerly Senior Center Without Walls), members can call in to hear Stagebridge storytellers weave their magic in this next installment of our Stagebridge / Covia Well Connected monthly concerts −and membership is free! The next meeting will take place in the CYF / Basement on Wednesday, May 22nd. Come join us! In observance of the Memorial Day holiday, Stagebridge and FCCO will be closed on Monday, May 27. Have a safe and peaceful holiday! The next meeting will take place in the CYF / Basement on Wednesday, June 5th. Come join us! Free Personal Storytelling Concert - listen or log in from home! Tune in on Tuesday, June 18 at 3:00pm to the next installment of Stagebridge’s FREE one-hour STORYTELLING CONCERT that you can listen to from the comfort of your own home. At the conclusion of the stories, listeners can participate in talkback discussion. Almost-summer Elder Salon at Stagebridge! The next meeting will take place in the CYF / Basement on Wednesday, June 19th. Join us and get ready for summer! In observance of the independencel Day holiday, Stagebridge and FCCO will be closed on Wednesday, July 4. Have a safe and peaceful holday! There’s more LUNCHTIME STORYTELLING in April at Stagebridge! This month, join Stagebridge storytellers Sally Holzman and Bill Zarchy for lunchtime tales, located in the Choir Room at the First Congregational Church Oakland. April's second Elder Salon at Stagebridge! The next meeting will take place in the CYF / Basement on Wednesday, April 17th. Come join us! April Storytelling Concert - listen from home! Tune in on Tuesday, April 16 at 3:00pm to the next installment of Stagebridge’s FREE one-hour STORYTELLING CONCERT that you can listen to from the comfort of your own home. At the conclusion of the stories, listeners can participate in talkback discussion. April showers bring…LUNCHTIME STORYTELLING to Stagebridge! This month, join Stagebridge storytellers Jeff Byers and Jeanne Lupton for lunchtime tales, located in the Choir Room at the First Congregational Church Oakland. April Elder Salon - no foolin'! The next meeting will take place in the CYF / Basement on Wednesday, April 3rd. Come join us! Founder Stuart Kandell visits Stagebridge! Fresh from Europe (where he now resides), Stagebridge founder Stuart Kandell comes by his old stomping grounds for a dialogue with our new Executive Director, Shannon McDonnell! Cost: Donations requested in Stu’s honor to Stagebridge before or at the event. RSVP here or mail by Wed. Mar. 20 at 3pm to: [email protected] (required to attend). Seating is limited. It’s your last chance to RSVP for Stagebridge founder Stuart Kandell’s visit on THU. MARCH 28 from 1:00 - 3:00pm as he discusses “Celebrating 70, by Inventing a New Life: The Highs, Lows, and In-betweens of Starting Fresh in a New Land” - a dialogue with our new Executive Director, Shannon McDonnell! The next meeting will take place in the CYF / Basement on Wednesday, March 20th. Join us and usher in the first day of Spring! Free Storytelling Concert - listen or log in from home! Tune in on Tuesday, March 19 at 3:00pm to the next installment of Stagebridge’s FREE one-hour STORYTELLING CONCERT that you can listen to from the comfort of your own home. At the conclusion of the stories, listeners can participate in talkback discussion. Save the dates–it's showcase time! From MARCH 18 - 22, come and see what our Stagebridgers have been working on. If you're considering enrolling in a class and just want a sample of what you'll learn, now's a great time to see for yourself! March into Lunchtime Storytelling at Stagebridge! Spring into Stagebridge’s popular monthly LUNCHTIME STORYTELLING event on March 14! This month, join Stagebridge storytellers Ben Tucker, Claire Castell, and Samir Saad for lunchtime tales located in the Gallery at the First Congregational Church Oakland. Don’t forget to “Spring forward” and set your clocks ahead one hour starting at 2:00am on Sunday, March 10! Daylight Saving Time runs through Sunday, November 3rd. The next meeting will take place in the CYF / Basement on Wednesday, March 6. Come join us! Stagebridge Open House - meet our new Executive Director! It’s Open House time at Stagebridge - join us in the Gallery to see what we have to offer, and enjoy light refreshments, entertainment, meet our new Executive Director Shannon McDonnell, and say farewell to our Interim Executive Director, Tracy Gary! You can also REGISTER in-person for the Spring session of Performing Arts Institute classes at this event— take a peek at the class schedule here! Registration for Spring Session of Performing Arts Institute classes opens! Wednesday, February 27 at 10:00am: Registration opens online and in-person for Spring session of classes running April 8th - June 14th. UPDATE 2/21: Due to unforeseen circumstances, this event has been moved to the CHOIR ROOM. We apologize for any inconvenience. Tantalizing tales are on the menu in Stagebridge’s popular monthly LUNCHTIME STORYTELLING event! For February, join Stagebridge storyteller Cynthia Cudaback and Clara Kamunde for lunchtime tales, located in the CHOIR ROOM at the First Congregational Church Oakland. Each free, hour-long noontime event features storytellers with a variety of pieces-some funny, some poignant, and all of them heartfelt. The next meeting will take place in the CYF / Basement on Wednesday, February 20. Come join us! Tune in on TUES., February 19 at 3:00pm to the next installment of Stagebridge’s FREE one-hour STORYTELLING CONCERT that you can listen to from the comfort of your own home. At the conclusion of the stories, listeners can participate in talkback discussion. All classes will be held on Monday, February 18 as usual. The Stagebridge office will be open with reduced staff, should you need assistance. Have a safe and happy holiday! Get in Line for Love Lines! *This event is now SOLD OUT/AT RUSH - There may possibly be tickets available at the door. If you RSVP'd and are attending, we suggest you carpool or get a Lyft or Uber, as parking in the area is very limited. It’s time for love…Love Lines, that is! For our annual Valentine's event, this year’s theme is What Makes Your Heart Sing? We’re looking forward to bridging generations by sharing love and the stage with the talented youth from Beats Rhymes and Life, one of our community collaborators in the RealTime collective. It’s sure to be a sweet event, and it all happens at Oakland's New Parkway Theater! Stagebridge artists include Claire Castell, Sally Holzman, Kiran Rana, Agnes Riedmann, Ben Tucker, Miyoko Sakatani, Joanne Grimm, Scrumbly Koldewyn and The Dreamers! More information here. Doors open at 6:00, and seats are limited on a first-come, first-served basis. The next meeting will take place in the CYF / Basement on Wednesday, February 6. Come join us! What Makes Your Heart Sing? Audition for Love Lines and tell us! Tell us what makes YOUR heart sing! Do YOU have a tale to tell? STORYTELLERS, we're looking for YOU! 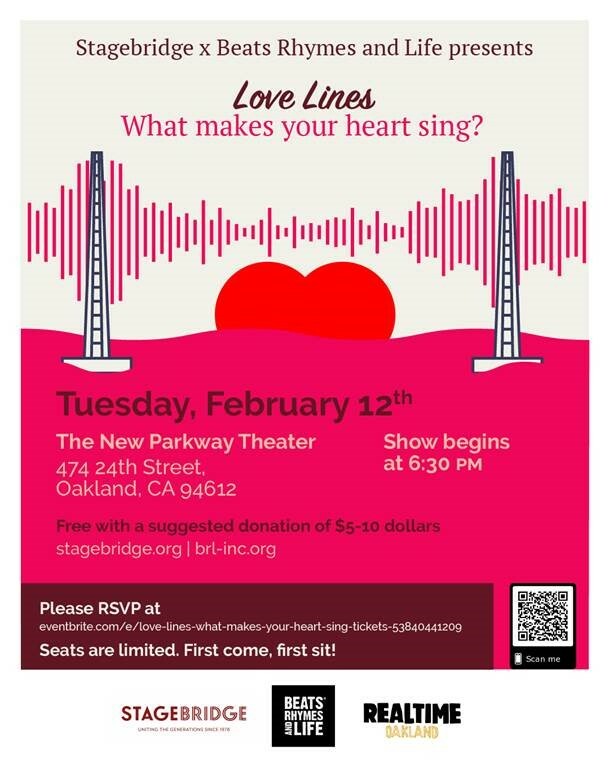 Love Lines auditions are Thursday, Jan 24 from 1:30 - 3:30pm in the Choir Room, so bring your best story or spoken word performance piece of five minutes or less. This year's theme is "What Makes Your Heart Sing?" Audition Forms are available in the Stagebridge office! Fifth season of LUNCHTIME STORYTELLING kicks off at Stagebridge! It’s a brand new season of Stagebridge’s popular monthly LUNCHTIME STORYTELLING event! Join Stagebridge storytellers Suz Shampanier and Jeanne Lupton for some lunchtime tales, located in the Gallery at the First Congregational Church Oakland. Each free, hour-long noontime event features two student storytellers with a variety of pieces-some funny, some poignant, and all of them heartfelt. Join us! The next meeting will take place in the CYF / Basement on Wednesday, January 23. Come join us! In observance of Martin Luther King, Jr. Day, Stagebridge will be closed on Monday, January 21 and there will be NO CLASSES held that day. We wish you a safe and peaceful holiday! If you have a class that normally takes place on Mondays and you have not been contacted by your instructor, please contact them for scheduled make-up class information. Tune in on TUES., January 15 at 3:00pm to the next installment of Stagebridge’s FREE one-hour STORYTELLING CONCERT that you can listen to from the comfort of your own home. At the conclusion of the stories, listeners can participate in talkback discussion. Playwriting Showcase at The Flight Deck! It’s time for the Playwriting Showcase, featuring exciting new material from playwrights in Anthony Clarvoe's Fall 2018 "Playwriting" and "Writing Full Length Plays" classes in a free evening of entertainment. Excerpts and short pieces performed by professional actors and directors will have you on the edge of your seat, and it's a great opportunity to enjoy a FREE evening of theatre while supporting local artists! This event takes place at The Flight Deck - 1540 Broadway in Oakland. Reserve your FREE tickets at sbplaywriting.brownpapertickets.com, or by mailing [email protected]! Event is free, but donations to help support our programs will be gratefully accepted at the door! PLEASE NOTE: Doors will open at 6:30pm; showcase will start at 7:00pm. As a courtesy to everyone, late arrivals will be asked to wait in the lobby until a break in between plays to enter the theater. Vote for Stagebridge's entry in a National Photo Contest! Help support Stagebridge and vote for our entry of some of our dynamic senior performers in action! *Note: Anyone can vote ONCE per day for EACH of the five days of the contest (so you have 5 chances to vote! ), so help support us and cast YOUR vote for Stagebridge, and share with your family and friends! New year, new Elder Salon season starts for 2019! The next meeting will take place in the CYF / Basement on Wednesday, January 2. Come join us! Winter holiday break continues through January 2 at Stagebridge. We will return on Thursday, January 3. Happy New Year!